Chris Packham’s memoir is a book about a lonely, troubled, isolated child who is at his happiest when he is out in the fields and woods discovering wildlife. A boy who is the freaky kid in school, probably a worry to his parents but who has far more potential than anyone else around him. If you were this kid, read this book. If you are the parents of a child who you suspect may just be this kid, read this book. If you expect a media friendly anecdote about a happy boy who came to be a television presenter, maybe stay clear. Fingers in the Sparkle Jar is an unbelievably, bloody, brave book which it is hard to believe anyone with a public profile would have written. I suspect that if this had not been written by a ‘celebrity’ it wouldn’t have been published which says far more about the lack of bravery in publishing houses than it does about Chris’s ability to write as the book is very well written with beautiful descriptions of nature and brilliant observation of Britain in the 1970’s with all it’s hot, dusty and disconnected edge. The book jumps around between times and perspectives but keeps it cohesion and the odd structure feels appropriate for the subject, sometimes you are in Chris’s head, sometimes you are observing him from someone else’s viewpoint. I think if you are deeply internalised then this is how you view the world. This book resonated with me on so many levels. I frankly was that child or one very like it. It took me right back to being an isolated and bullied girl in a rough comprehensive and finding solace in nature books. It bought home the absolute necessity of being completely honest in your writing because only then can you reach out to others who feel the same way and give them something of real value. 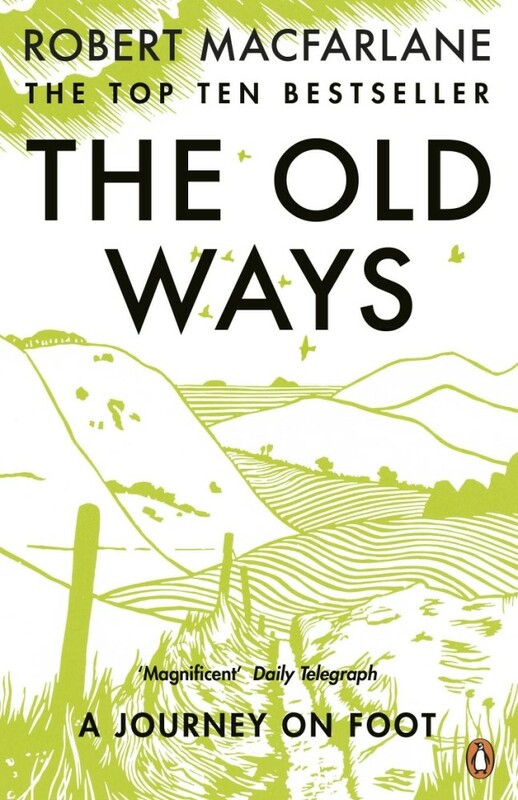 Written in 1885, After London tells the story of a pastoral world which has evolved after a disaster has swept away the technology, cities and memories of the 19th century. The people that have survived this disaster have separated into distinct casts from the primitive bushmen, the gypsies and outcasts, to serfs and nobles who exercise supreme power and are rule with merciless violence. The story follows the journey of Felix, a nobleman’s son who has fallen on hard times and sets out to better himself and win the hand of his beloved Aurora. This is a simple tale of adventure, quest and discovery. The basic telling was actually refreshing, devoid of the convoluted language and clever philosophy that seems necessary for writing to be considered ‘good’ in the modern world. the book ends with Felix heading out once more into the unknown and the reader is left with the hope that Jefferies wrote a sequel. Sadly, it seems, he never did. 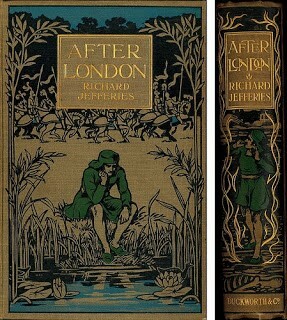 After a childhood on a Wiltshire Farm not unlike the estate depicted in After London, Jefferies ran off to France with his cousin and tried to walk to Russia, when this proved unsuccessful they boarded a boat to America but were sent home when it was discovered they had no money for food. Jefferies took to wandering the countryside with hair down to his shirt collar, dishevelled clothes and a gun over his shoulder, an appearance which made him an object of some concern in Swindon. He spent many solitary hours laying beside stone circles seeking a deep connection with nature. After a stint as a newspaper reporter, Jefferies began submitting articles about nature and rural life to magazines. He published several books during his lifetime but a long battle with tuberculosis meant his productivity was never great and he was obliged to ask for the assistance of the Royal Literary Fund to sustain him and his family. He finally lost his battle with TB in 1887. After London is an immensely enjoyable read and an ambitious attempt to imagine a post apocalyptic society. A book well worth tracking down through your local library or second hand book shop. ‘I borrowed an axe and went to the woods,’ wrote Henry David Thoreau and so begins his two year experiment in living simply. Thoreau felt that man wasted his life by working to pay off a large mortgage and acquire material goods so he could keep up with his neighbours, where as, if he only lived simply, worked with his hands to grow and catch his own food and gave up the pursuit of stuff he did not need, then he could devote his time to the things he really wanted to, which in Thoreau’s case was the study of nature and writing. Here was a man years ahead of his time, both as an environmentalist and anti-consumerist, living by ideals which are all the more relevant today. At times, the writing of Walden is overly dense by modern standards and is more of an educational lecture than entertainment but there are moments of true beauty and insight in his writing and his delight in the natural world and love of Walden Pond races off the page. 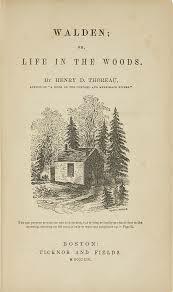 Thoreau died an untimely death at 44, having gone out in a rain storm to count tree rings, but, by all accounts, he was at peace with the world when he died presumably because he had succeeded in his quest to live deliberately and did not find, when he came to die, find that he had not lived. In Waterlog Roger Deakin sets out to swim his way across Britain taking us on a summer’s journey through leafy backwaters, plunge pools in the hills, across the mouth of estuaries and through a series of outdoor swimming pools. On the way he argues with officious river ‘owners’ and challenges the Environment Agencies insistence that our rivers are nowadays dangerous, polluted waterways likely to drag you into there depths or poison you with all manner of chemicals and mysterious sounding diseases. Roger is seemingly oblivious to social conventions which, in Britain at least, dictate that, nowadays, stripping down to your trunks or beyond and going for a swim in the local river is simply not on. He reminds us that it was not that many years ago when most people learnt to swim outdoors. With every stroke you want to cheer this man on. He liberates us from the chlorine filled crowded halls of our local swimming baths, he invites us to reclaim our rivers, lakes and forbidden waters, he encourages us to ignore what others might think of us. This has been the perfect read for a winter in which rivers have been rarely out of the news. Usually because they have burst their bank,s like a convict escaping from jail. Waterlog reminds us that our rivers are also a national treasure which should be kept as wild as possible and not trained into concrete sewers. Reading this beautifully written book I wanted to head out and take back my local river by plummeting into it, but it is winter and the river’s are flooded and spreading across the land. Instead I am going to head to my local baths and learn to swim with the same elegance and economy as Roger so I will be able to sample their delights come summer.